Vertical farming (VF) of transplants in growth rooms with LED lights, CO2 injection, and precise control of temperature & humidity has potential to optimize the rooting environment. However, increased cost of VF (especially capital and electrical cost) needs to be offset by shorter crop time and increased rooting success compared with greenhouse (GH) production. Dr. Paul Fisher and his Ph.D. student, Megh Poudel are evaluating costs & benefits of VF for tissue culture transplants. Megh is interested in 1) evaluating the production time of tissue culture transplants in VF and GH environments, 2) determining optimum conditions for rooting and crop uniformity in VF for tissue culture material, and 3) developing an enterprise budget for VF of tissue culture transplants that growers can use in management decisions for their own operation. M.S. en route to Ph.D student, Clemson University. Melissa Muñoz Agudelo. Currently evaluating traditional and alternative management strategies for Botrytis control in cut rose production greenhouses. Botrytis cinerea is a significant problem affecting cut rose production in both pre-and post-harvest conditions which leads to losses for both growers and wholesalers. One of the principal strategies for disease management is fungicide applications including multisite and site-specific fungicides. However, the development of resistance is becoming more problematic especially in the case of the site-specific fungicides, making them less effective. We are helping growers by evaluating fungicide resistance development, monitoring cultural practices and environmental factors that are associated with disease development to create a risk model that lead to better strategies for fungicide applications and we are evaluating alternative management strategies for disease management using post-harvest calcium dips. Develop a Botrytis risk model, based on climatic variables, adapted from the Strawberry Advisory System. M.S. 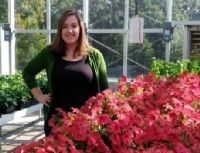 student at Clemson University, Katherine Bennett, is investigating calcium as an alternative to fungicides for Botrytis control. Petunia Flower Meltdown, or rapid necrosis of petunia flowers, is a problem during transport of flowering plants from the greenhouse to retail locations. This phenomenon is a result of Botrytis infection in the greenhouse, and the disease expression occurs when the plants are placed into a humidity environment during transport. We are looking at alternative compounds for control as fungicides are becoming less effective due to resistance development. Initial studies demonstrated the potential value of calcium to inhibit Botrytis infection in petunia flowers. So, we are conducting experiments to determine the best strategies for applying calcium to reduce the postharvest losses that occur due to Botrytis infection. Determine optimum application method (fertigation or spray application) for maximum uptake of calcium into flower tissue. Examine different calcium sources for their potential phytotoxicity and efficacy for reducing Petunia Flower Meltdown. Additional species will be tested to determine if calcium applications can also work on them. Roses and gerbera daisies are the next species to be examined. M.S. student at Clemson University, Jiwoo Park, is working on growing petunias for improved consumer performance. Consumer performance is critical to the success of greenhouse businesses. In recent years, greenhouse growers have reduced the amount of fertilizer applied to their spring bedding plant crops. This has resulted in concern about the performance of these plants once the consumer has purchased them. This experiment was designed to determine the effect of different fertilizer delivery methods and fertilizer concentrations on the growth of petunias (Petunia x hybrida) in the consumer environment. We focused on three fertilizer delivery strategies: Constant Liquid Fertilization Program, Controlled Release Fertilization Program and Post-Production Fertilizer Pulse Treatment. This study also examines the fertilizer cost efficacy associated with different fertilizer application techniques. Examine the effect of production fertilization practices on consumer performance of petunia. Determine an effective technique for delivering attractive plants that continue to perform well after the retail purchase. Determine the cost for the different fertilizer delivery methods. Erin Yafuso is a Ph.D. candidate at the University of Florida is working to assist growers by identifying the best ways to supply adequate water and oxygen to plants roots. 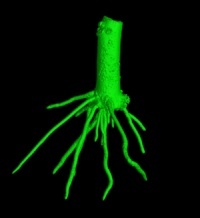 Producing a healthy crop is anchored in the roots of a plant. Dr. Fisher and Erin are studying the relationship between water to oxygen and effect on rooting in container-propagated plants. We will focus on (1) evaluating a technology to super-saturate oxygen in irrigation water (2) quantifying substrate microenvironment the balance between water and air (3) quantifying the effect of substrates at varied moisture level on root growth by 3D imaging (as seen in the image). Erin comes from Hawaii with a B.S. and M.S. degrees from the University of Hawaii at Manoa in Molecular Biology, she would like to pursue a career in plant sciences. 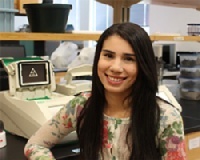 Maria Fernanda Trientini is a research associate at the University of Florida, under the supervision of Dr. Paul Fisher, is researching the use of Controlled Release Fertilizers (CRF) in hydroponic systems. Hydroponics are being promoted for urban homeowners, and is an expanding market to sell transplants and growing systems. However, nutrient and pH management are too complex for most consumers. Nowadays, new CRF materials are available in the US. In this project, Dr. Fisher and Fernanda aim to simplify nutrient management in hydroponics by formulating a standard dose of blended CRF per gallon per month. This would improve consumer success with ‘grow your own’ vegetables. 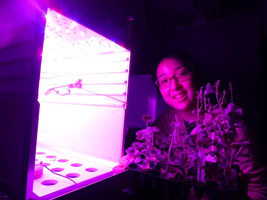 Post-doctoral research associate Yujin Park at Michigan State University investigates how the radiation spectrum of sole-source LED lighting influences growth and development characteristics of floriculture transplants. A new method of producing floriculture transplants is indoors using light-emitting diodes (LEDs). However, one of the challenges and opportunities of implementing this new production technique is to determine the radiation spectrum to obtain desired plant responses. The quality attributes of floriculture crops, including plant size, leaf color, growth habit, and flowering time, can all be modified by the radiation spectrum, and also plant responses can vary among plant species and cultivars. Yujin’s research is investigating how different spectral and intensity combinations from blue (400-500 nm), green (500-600 nm), red (600-700), far-red (700-800 nm), and white LEDs interact to regulate photosynthesis, plant growth, and flowering responses on a broad range of floriculture crops. The results from previous experiments identified the potential benefits of including far-red radiation in the lighting spectrum, including increased seedling growth, regulation of plant size, and earlier flowering. We also learned that far-red radiation combined with a moderately high intensity of blue radiation can produce compact plants while accelerating flowering time in some species. To best utilize sole-source LED lighting technology in floriculture transplant production, this research will further generate new science-based information on the kinds of plant responses and benefits growers can achieve by managing the radiation spectrum. M.S. candidate Sofia Flores Vivar at the University of Florida, under the supervision of Dr. Rosanna Freyre and Dr. Paul Fisher, is researching the potential of ginger and turmeric as new container-grown crops. Ginger and turmeric have multiple uses, including food, medicinal, beverage, and ornamental. They can be grown under greenhouse conditions, where day length and temperatures can be manipulated to produce a locally grown superfood. The main objectives of this research project are (a) to evaluate plant material sources and cultivars for the greenhouse and field production of ginger and turmeric as superfoods, and (b) identify environmental conditions that extend the growing season of plants by avoiding dormancy during short days, and improve rhizome production for an increased crop yield. 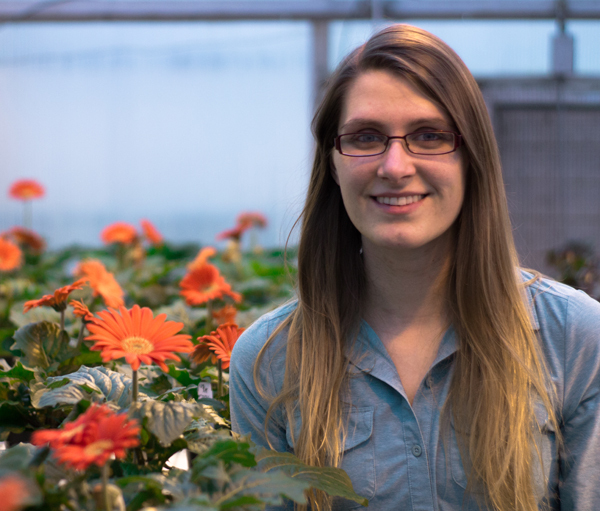 Kellie Walters, a Ph.D. student at Michigan State University, is working on the production, flavor and color enhancement of leafy greens and culinary herbs in controlled environments. She is evaluating how light intensity and quality, short wavelength radiation, carbon dioxide, and temperature interact and influence leafy green and herb flavor, volatile oil content, anthocyanins, growth, and development. Additionally, she has several side projects that include 1) quantifying the impact of carrier water alkalinity and air temperature at application on the efficacy of various plant growth regulators (PGRs) including ethephon and 2) determining the photoperiodic flowering responses of several specialty crops. The plant growth regulator (PGR) ethephon [(2-chloroethyl) phosphonic acid] breaks down to release ethylene (C2H4) and can be sprayed on floriculture crops to reduce cell elongation, inhibit internode elongation, reduce apical dominance, increase lateral branching, and abort flower buds and flowers. However, the efficacy of ethephon applications is influenced by a variety of environmental and cultural factors. For example, As pH or ambient temperature increases, ethephon efficacy decreases. This is due to ethephon breaking down into ethylene more quickly before it is absorbed by the plant. Since carrier water alkalinity affects solution pH, Kellie is quantifying how ethephon efficacy is influenced by carrier water alkalinity and air temperature at application. With increased efficacy comes the potential for lower chemical inputs, increased uniformity, and higher quality plants. Kellie is also determining the photoperiodic flowering responses of several foliage annual plants, herbs, and hop vines. Growers are increasingly incorporating foliage annuals into mixed combination planters due to their brightly colored or patterned leaves. However, the flowers of these foliage annuals are often unattractive and stall the desired vegetative growth. Therefore, our goal is to provide photoperiodic lighting recommendations to prevent flowering in foliage crops and herbs and enhance cone production of hop vines grown in controlled environments.